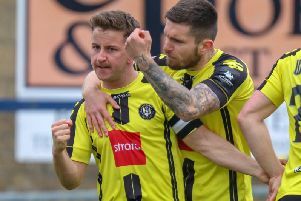 Ripon City must finish as winners of the relegation ‘mini-league’ in order to survive the drop this season according to manager Steve Donoghue. Donoghue’s side lost their 14th game of the season on Saturday, going down 5-1 away to Knaresborough Town Reserves, leaving them rooted to the bottom of the Premier League with just eight points. Ripon are currently seven points from safety and, with fellow relegation rivals Boroughbridge and Brighouse both losing at the weekend, Donoghue believes there is still a chance of survival. He said: “What’s happening now is that we are confident three teams will be relegated and, if you look at the teams down there, there is a mini-league of sides. “It seems whoever finishes top will stay up. That’s the way we’re looking at it but it’s not going to be easy. Knaresborough Town’s Brad Walker hit four of the five goals in the rout but Donoghue blamed individual mistakes for his side’s heavy defeat. Walker was available for the reserve side after Knaresborough Town’s first team match against Dronfield Town was abandoned early on Saturday morning. The striker took full advantage of his return to the side, grabbing a brace before a James McDaid penalty. Walker struck twice again in the second half before Fraser Lancaster made the three points safe.